When it comes to sharing your special day with the rest of the world, there are many new ways to go about it. Social media has become the way in which we share practically everything that happens in our lives. What better way to share the most important day of your life, than via your favorite social media sites such as Facebook, Instagram, and Pinterest? Wedding sparklers make a great way to spice up your pictures and add a touch of magic to your posts. By now most people have become inured to the thousands of images they scroll by every day. If you really want them to "see" your photos, make use of the various sizes of wedding day sparklers to create unique and amazing wedding photos. But just having someone standing there with wedding sparklers in their hands is really not enough. If you really want eye-catching images, you have to be prepared to step outside of the box. At Wedding Sparklers Outlet, we carry three different sizes of wedding day sparklers for you to choose from. These are 10, 20, and 36-inch sparklers and we also carry heart-shaped wedding sparklers to add even more magic to your photos. Use your guests and sparklers to spell out words like "LOVE", "KISSES", the date, and many others, adding vivid details to the images to make them really pop. Instagram has long since been the reigning champion with regard to sharing photographs. Light up your first kiss as husband and wife by having your best man and bridesmaid hold heart-shaped wedding sparklers over the two of you. This makes for an incredibly romantic shot of the new couple to share on any of your favorite social media accounts. By sharing your photos in this manner, far more of your family members and friends will be able to see them, no matter where they live in the world. You probably already know that you can use Facebook and Instagram to share videos. Have your wedding party line the walkway outside the church holding wedding sparklers above their heads to create an illuminated archway. You can take your first walk as husband and wife together through this magical pathway. Choose one guest to create a video that can be shared with everyone by simply uploading it to your favorite social media sites. Everyone gets to see you just as if they were there with you. 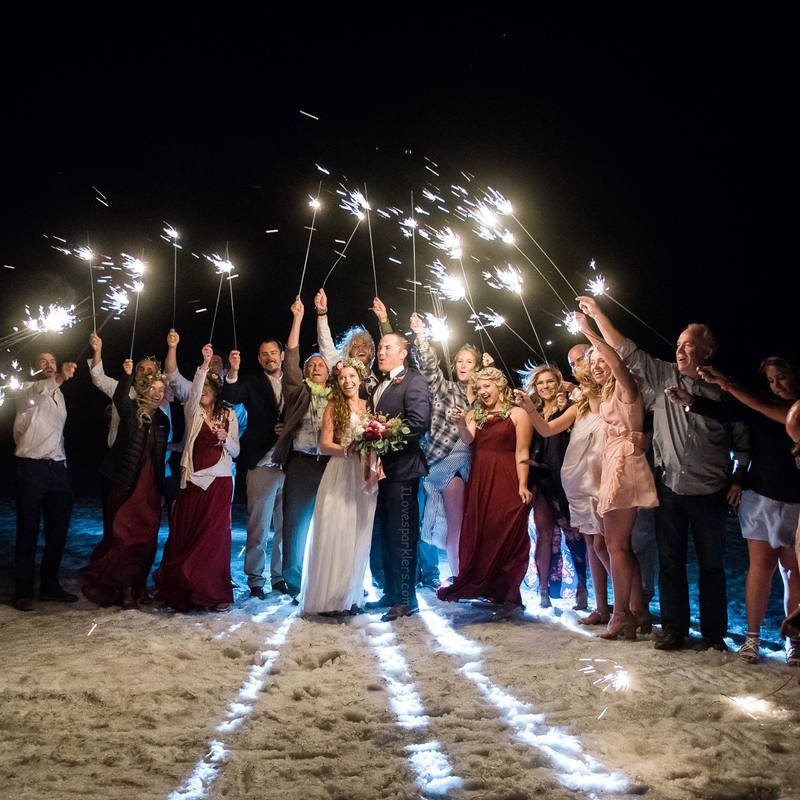 No matter where you plan to share your wedding photos and videos, including wedding sparklers is a wonderful way to add a special magical touch to them. Bear in mind that our wedding sparklers are smokeless and safe for indoor use. They are also safe for the younger members of your wedding party as long as they are being supervised by an adult. For more information or to order your wedding sparklers, visit Wedding Sparklers Outlet and choose from our huge selection. Be sure to order plenty of our wedding day sparklers for your guests and order early to ensure they arrive on time!